I was not one of those women who had the “pregnancy glow”. There was no glowing going on here. One year ago today, at this exact very moment, I was a house. Had I gone to the beach, people would be trying to push me back into the ocean. I was 2 days shy of giving birth to Boogie and I. Was. Miserable. At the very end of my pregnancy, I couldn’t eat or drink (even water) without getting heartburn or reflux, and sleeping was impossible. If I ever even got remotely comfortable, the comfort would be interrupted by my need to get up and take Pepcid and/or pee. Ugh, Pepcid. This is where it gets glamorous because my doctor said that every woman is tortured by some ailment during their pregnancy. Mine? Yeast infections. Too much information? Probably, but had you been around when I was pregnant you would have already known this because Rutherford would have told you. Oh yeah. I can laugh now at the memory of standing in line at Walgreen’s with him, my 18th bottle of Pepcid in one hand and a box of Monistat in the other and him giggling like a 12 year old and loudly saying the word “Vagisil” over and over while in line. Back off ladies, he’s all mine. Needless to say, I couldn’t wait to get this kid out of me. On top of all that, she wasn’t dropping and I wasn’t dilating. I was a week from my due date of March 17th and the wasn’t budging. My ribs were bruising and I would cry over the pain in my ribs and back and praying she would just drop. But no. The next picture is of my sister-in-law, Celena, right after Boogie was born. She told me to take this photo because this is what she as doing in my belly, hence the extreme pain. 22 1/2 inches at birth and me with a 32 inch rib cage. Ouch. On March 10th, 2010, I had my last weekly doctors appointment before Boogie’s due date and I was done. Done being pregnant, done with not sleeping, done with the Monistat, done with it all. That day I sat on the table and PRAYED I was dilated, even a little bit. Give me something! A light at the end of the tunnel or SOMETHING! But no, Boogie wasn’t cooperating or budging. And that’s when I started to cry. I cried and put my foot down. I decided then and there I was NOT leaving till I was told exactly what my doctor planned on doing about this injustice! I’m sure I said more than this and probably a bit more colorful than that but you get the gist. Praise the Lord! Sweet Baby Jesus! Next thing I knew we were checked into the hospital, I was hooked up to machines and tubes, and Mom was heading to the airport in San Diego. And wouldn’t you know it…that’s when the contractions started. Of course. The next few hours were painful but fast and before I knew it I was being wheeled into the operating room, shot in the back and Rutherford was by my side. What I remember from those minutes was lots of tugging, my ribs hurting and Katy Perry music. 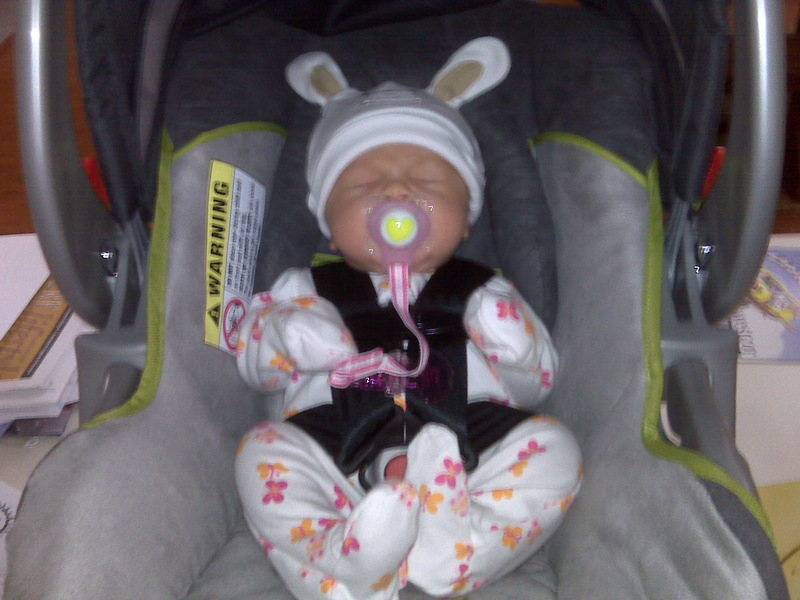 At 5:24 pm on March 10, 2010, Audrey Elizabeth was born…all 8lbs 10.9 oz and 22 1/2 inches of her. As soon as they pulled Boogie out, Rutherford went to be with her and I cried to my anesthesiologist that I thought they broke my ribs. He promised to give me something good (and boy did he deliver) but he wanted to wait till I got to see the baby for the first time, he wanted me to remember it. Do you see that? 8 lbs, 10.9 oz. He hasn’t let go of her since. The wonderful man with the drugs gave me Demerol and I was the happiest person in the world. I guess a little too happy because I heard from family later that my doctor called me Michael Jackson, Rutherford referred to me as Jim Morrison and my friend Jennifer, who was waiting in my hospital room, said she could hear me talking and laughing as they wheeled me from the OR back to my room. Can I get some of that to go? Now here we are, just about a year later, Boogie is half precious angel baby, and half menace dog torturer. Life has changed in every way possible. "I'm done! I'm done, I tell you! She's cooked! She's ready! PUHLEEZ get this kid out of me! I can't take it anymore!" Awww… that's lovely and funny (sorry for laughing at your pain, literally) and I enjoyed it immensely, Nicole. Thank you! p.s. Here's a photo of my wife and I and our wee one 2.5 years ago. Awwww! Didn't the year go by way too fast! My 21 yr old daughter is pregnant right now… she has been complaining about being uncomfortable and such… She is only 24 weeks – the fun has not even begun yet for her!! Happy Birthday Lil One! The heartburn. God, I had heartburn. Moose was due on March 17 too! And that picture of Boogie coming home in the rabbit suit–seriously cute!! !